The FC1700C replaces the previous FC1600C model. Although equipped with the larger 120 hp Tier IV Final Cummins QSB3.8 l engine, the FC1700C hood profile is not compromised offering best in class visibility to the hopper. 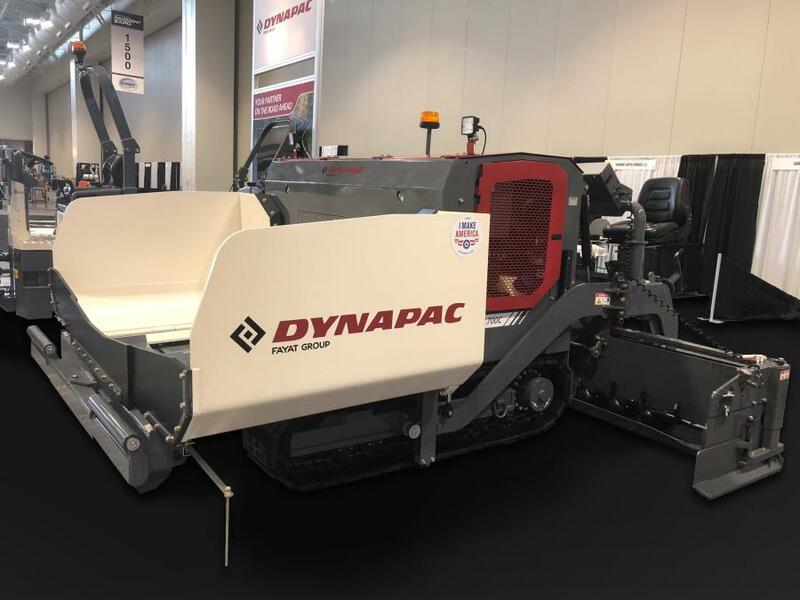 Dynapac North America upgrades commercial class paver range with the new FC1700C, FC1400 II, and FC1300 II. The new pavers are equipped with EPA Tier IV Final certified emissions regulations-compliant engines and offer new features that takes the Dynapac commercial class paver range to the next level. The launch of the new FC1700 will take place at the National Pavement Expo in Nashville, Tenn. The FC1700C replaces the previous FC1600C model. Although equipped with the larger 120 hp Tier IV Final Cummins QSB3.8 l engine, the FC1700C hood profile is not compromised offering best in class visibility to the hopper. The lower conveyor dumping height and larger 9.5-ton (8.6 t) hopper capacity increases paving distance by a third before reloading the hopper is necessary. The wider 14 in. (35.5 cm) track pads further improves traction when paving on soft surfaces by reducing the ground pressure. New operator controls are more intuitive and include individual color displays on both consoles. The screed heat and the pile height controls are integrated in the displays for ease of operation. The "Pave/Resume" feature is unique and brings the automatic feed and travel functions to the previous state when stopped for truck exchange. Value added standard features include hydraulic screed crown, hydraulic screed extension height and slope, heated end gates and Dyn@link telematics system making the FC1700C versatile on large parking lots or county roads. The 4,500-lb. (2,041 kg) heavy-duty VF0816 screed and mounted four auger system offers best in class paving quality and density behind the screed. This system allows paving at 8 or 15.5 ft. (20 or 4.7 m) without the need of shoveling asphalt to the end gates. The fail-safe screed heating system is one of kind on the commercial class paver range delivering uninterrupted heating to the screed plates, according to the manufacturer. The Dynapac FC1400C II is the second generation of mid-size Dynapac commercial class pavers now offered with a 74 hp Tier IV Final Cummins QSB 2.8 Engine. The new engine does not require a DEF system making it simple to maintain and operate. Improvements in ease of operation and maintenance include a new color display on the control panel providing vital engine codes. Performance is enhanced with the VF0814 screed now offered with standard electric heating, an upgrade to the gas-heated version from the previous generation. The fail-safe electric heat system is designed from the larger FC1700C model with 12 kW generator attached directly to the diesel engine for increased efficiency and faster heat cycle. The heavy duty 3,200 lb. (1,451 kg) VF0814 screed offers best in class density and mat quality, reducing the need for multiple roller passes. The screed mounted four auger system makes the 14-ft. (4.2 m) paving width seamless. Closing out the new commercial paver range, upgrades to the Dynapac FC1300C II include a Kubota D1505, 24 hp Tier IV Final engine. This tilt hopper paver with independent flow gates is perfect for small drive way or patching jobs. The heavy-duty construction of this paver stands above the rest in terms of longevity. "The second generation of Dynapac commercial paver range further proves our commitment to paver owners and operators. The updates on these models are based on continuous feedback from the paving contractors about what works the best on the job site," said Vijay Palanisamy, senior product marketing manager. Download Product Specs: CC1700C, CC1400C II and CC1300C II. For more information on Dynapac products, visit www.dynapac.us.